Does anyone want an adorable little cat or two? I've been feeding these two sweet little cats since they were babies but now the owner of my building and the building manager are threatening to throw me out if they catch me feeding them again. 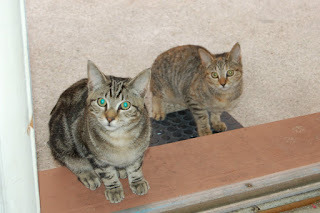 The cats now come and hang out on my doorstep and wait for me to feed them. I have to feed them late at night when no one is around. The cats are adorable and could use a good home. We are not allowed to have pets in the building and the manager has kicked people off the premises who were just visiting with their dogs. The manager has threatened to poison the cats if they continue to hang around the building. I don't want to get kicked out but I can't stand to see these cats starve. I also don't want them poisoned so I must find them a new home. Please help. I'm in South Beach.